Mickey started fly fishing in 1974 and started fly tying a year later. A few years after that he began teaching fly tying and continues to teach today. He started working at Angler’s Inn in January 1980 where he taught fly fishing as well as assisting customers with their equipment needs. He is now a co-owner Fish Tech Outfitters in Salt Lake City. Mickey enjoys fishing for Pike as well as trout. He held the world record for a Pike on a fly from in the 12 lb. line class from 1983 – 1988. In addition to fishing and tying flies, he has been instrumental in product design for several companies. At one point in his career, he was the head soft goods designer for the Rising Company and on their Pro Staff. He won the Best of Show Award for Chest Packs and Vests at the International Fly Fishing Show and twice for the Flask Pack. He has been a Signature Fly designer for Umpqua Feather merchants. He was also part of the Cortland Line Company Pro Staff where he helped with the casting and fishing for the Trout Boss fly line. He has also appeared on numerous local outdoor TV programs in the Salt Lake City market. He authored the first fly tying CD, Amiable Instruction. He helped with the startup of the William Joseph Co as a consultant by designing the first Mini-Chest Pack. Mickey was the first instructor in Utah certified by the Fly Fishing Federation as a fly-casting instructor and is the longest registered instructor in Utah. He has taught fly casting for the Sage Rod Company in Utah, Idaho and Montana. He is also a member of Sage Rod Company Elite Pro Staff. He is a nationally certified instructor for The Becoming an Outdoors Woman (BOW) Program and an instructor for Women in the Outdoors (WITO) program. 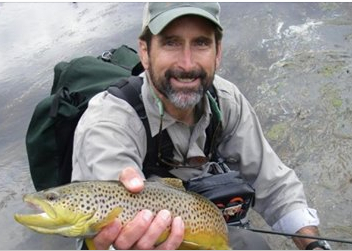 He is the fly fishing advisor for four local Utah high schools – Alta, Bingham, Brighton and Hillcrest. He was awarded the Stonefly Society’s Presidents Award in 2000 and the ‘Gean Snow’ award in 2017.